The iconic economic “box on wheels” that is the Mini has been the auto de facto face of the United Kingdom for over a half a century. Most recently seen in the Opening Ceremonies of the 2012 London Olympic Games, this car culture icon boasts an impressive resume of memorable TV and film appearances of which these 10 are among the most famous. 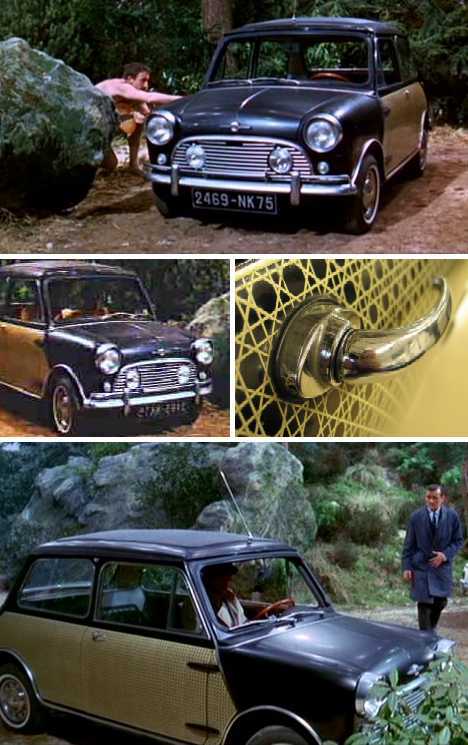 Actor Peter Sellers loved his custom 1963 Hooper-bodied Morris Mini so much he arranged to have it “cloned” by coachbuilders Radford for use in the 1964 film A Shot in the Dark. The car’s intriguing wickerwork body panels were not as fragile as one might expect, nor was the pattern painted on. Instead, actual wicker was sanded on both sides until it was paper-thin, applied to the car’s sheet metal, and finished with a layer of varnish. The Radford Mini de Ville used in the film was also a 1963 model and after filming was complete, Sellers presented it to director Blake Edwards as a gift. Edwards subsequently shipped the left-hand-drive Mini to California where it regularly appears on the show-car circuit. Cult classic sci-fi/spy-fi series The Prisoner ran for just 17 episodes; its original British TV run beginning in September of 1967 and ending on February 1st of 1968. 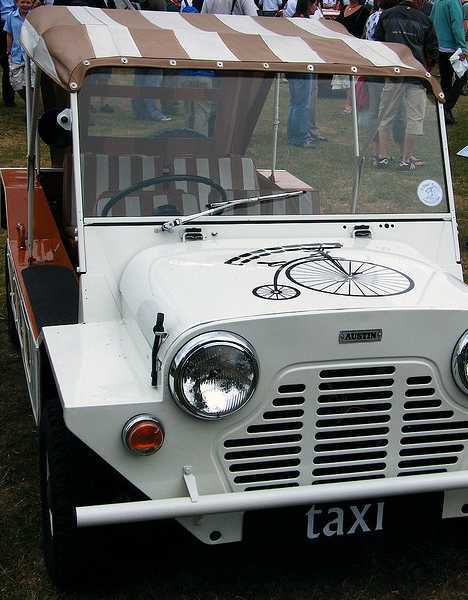 The show was set in “The Village”, a surreal & ultra-secure community serviced by Mini Moke taxis. The Mini Moke – “moke” is an archaic English word meaning “donkey” – was an offshoot of the basic Mini originally developed for the British Army, but rejected as it had too little ground clearance. Instead, it was marketed as a civilian utility vehicle and was the car of choice for police forces in Macau and Barbados. Sold in the UK from 1964 through 1968, the Mini Moke proved especially popular in Portugal where it was produced until 1989. One of the great achievements of the mini was the way it appealed to all classes and subcultures of British society. 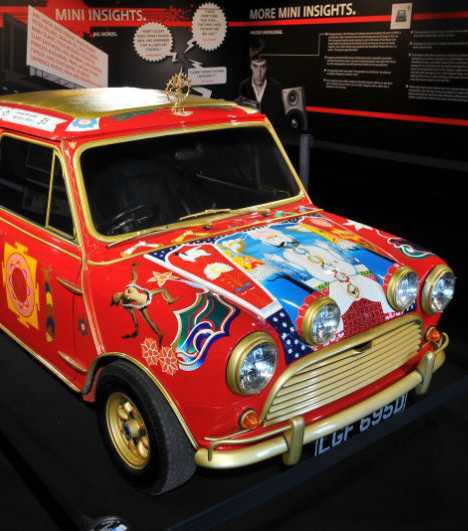 One notable Mini fan was George Harrison of The Beatles, who decorated his 1966 Radford Mini de Ville in psychedelic style bursting with Eastern philosophical symbolism. 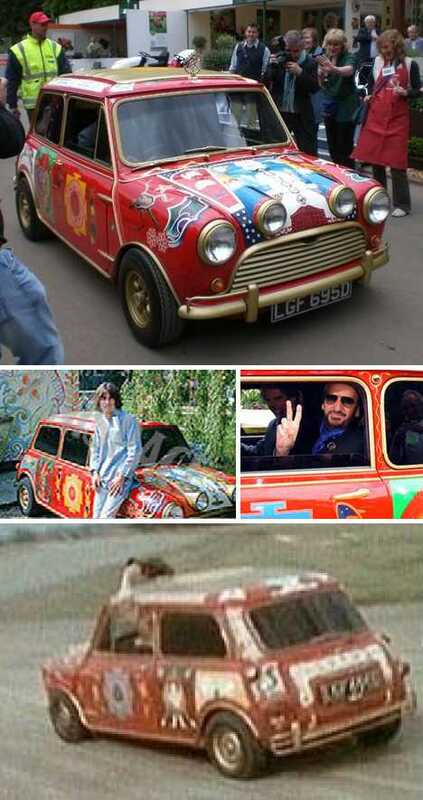 Harrison’s Mini appears in the 1967 film Magical Mystery Tour and unlike many “movie cars” survived the shot unscathed. Indeed, Harrison held onto the car for many years after both The Beatles and the psychedelic era were history, going so far as to rebuild and restore it in the late 1990s. 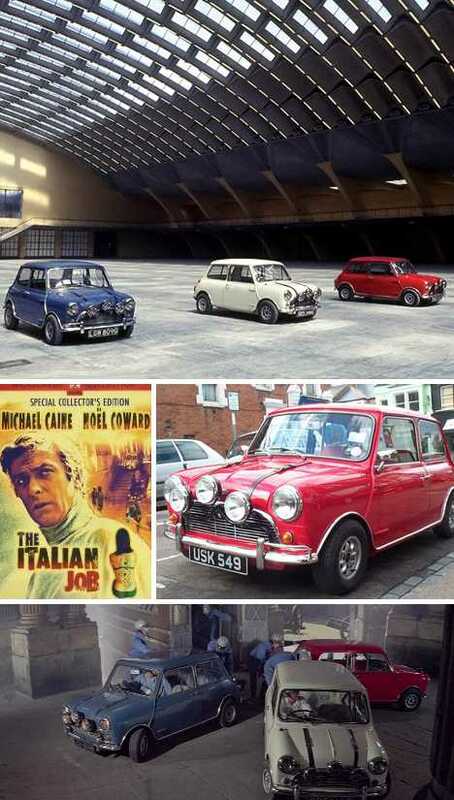 Perhaps the Mini’s major moment of glory (and one of the earliest and most egregious examples of cinematic product placement) came in 1969 with the release of the action-adventure flick The Italian Job. 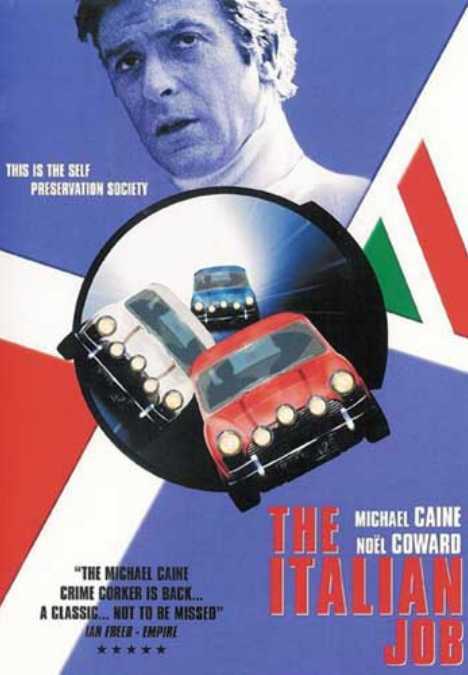 Though officially starring Michael Caine and Noel Coward, the film’s real stars were a trio of modified Mini Coopers festooned with accessory lights and painted red, white and blue. British Motor Corporation, manufacturers of the Mini, was notoriously cash-poor and refused to donate any cars to the producers – over 30 Minis were eventually bought. 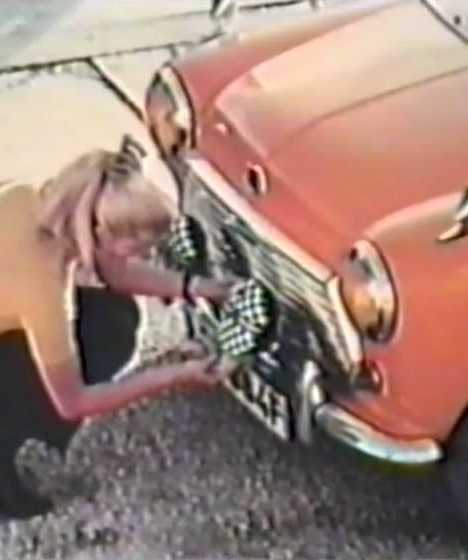 The cars featured in the film appear to be Mk1 Minis with rounded grills but BMC had switched over to the more angularly-grilled MkII Mini in the summer of 1967. The producers ended up modifying a number of MkII Mini models to cosmetically appear as the earlier models. 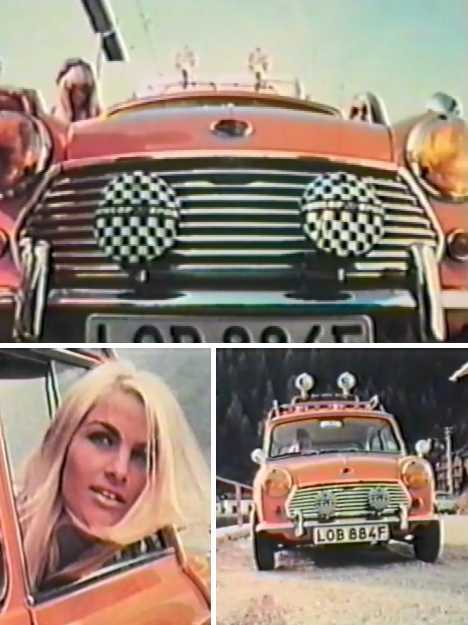 The rather obscure and short (just 25 minutes) 1969 film Vive le Sport is notable for its car star: a 1969 orange Mini Cooper S. The film epitomized the trend of so-called “road movies” that were visually appealing yet did not require big budgets, strenuous acting or expensive special effects. 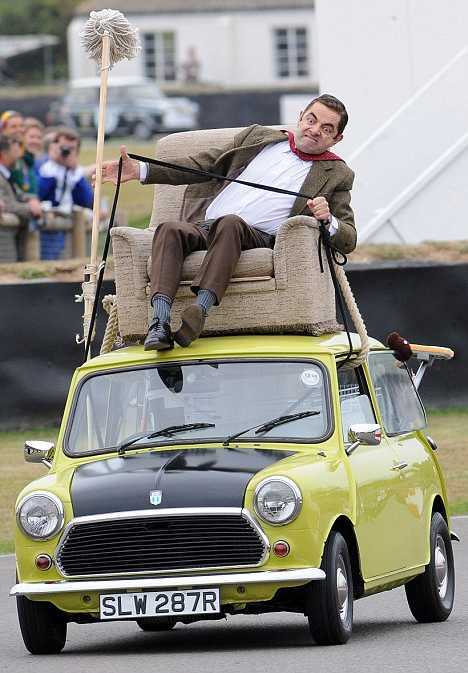 Britain’s international man of misery, Mr. Bean, also appeared in the 2012 Olympic Opening Ceremonies and his association with the Mini goes back decades. 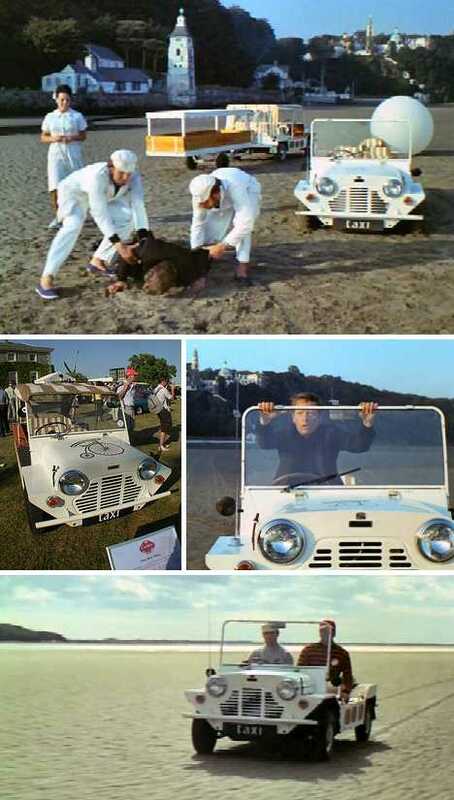 Bean was first seen driving an orange 1969 BMC Mini MK II but that car was wrecked while filming one of the show’s early episodes. 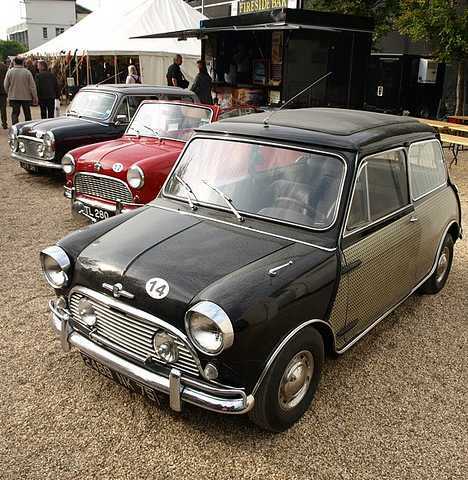 It was replaced by a 1976 Mini 1000 MkII in “applejack green” with a matte black hood. The manual door lock was provided by Mr. Bean and was not an available factory option. 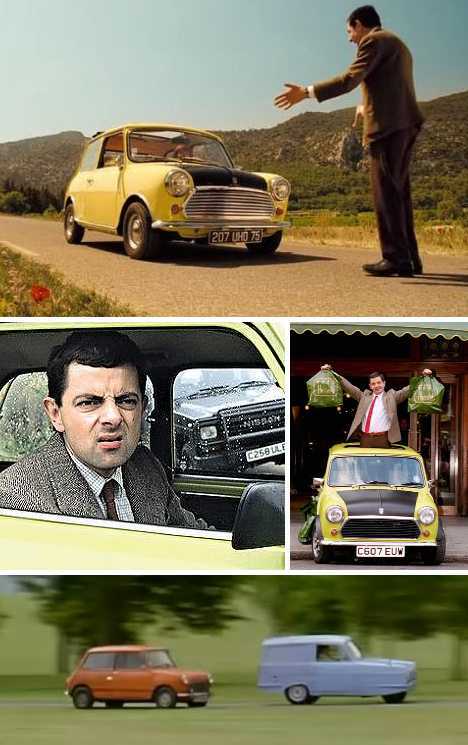 Most of Mr. Bean’s most famous (and arguably most hilarious) Mini-related scenes involved run-ins (literally) with his arch-nemesis: a sky-blue, three-wheeled Reliant Regal Supervan III. 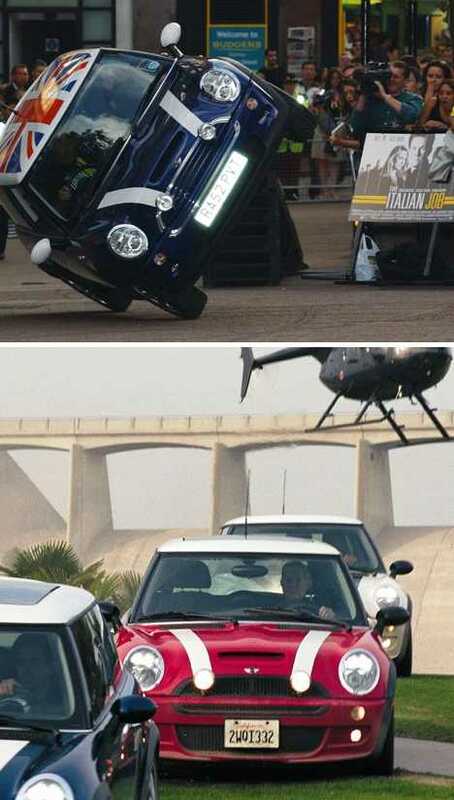 Mr. Bean and his Mini always got the better of the Reliant which usually ended up tipped over and/or run off the road. 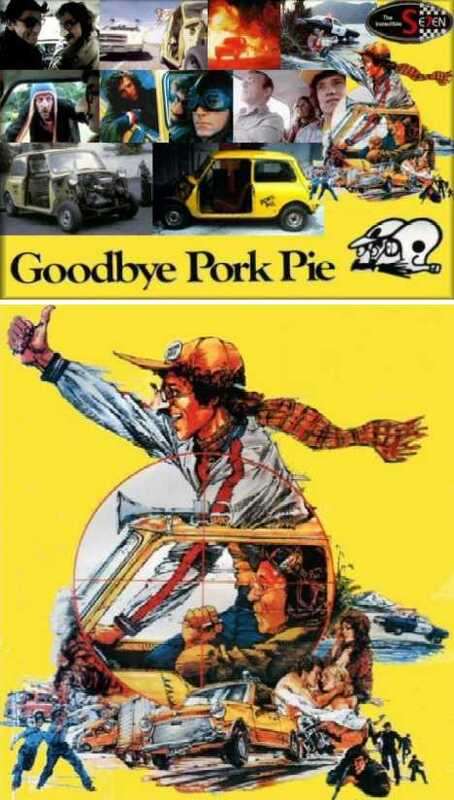 The 1981 action adventure comedy film Goodbye Pork Pie may be New Zealand’s most iconic film, combining the best elements of the formulaic Road Movie with a genuine human story of love lost and won. The film is also a showcase of New Zealand’s natural scenic beauty unrivaled until the release of the Lord of the Rings films two decades later. 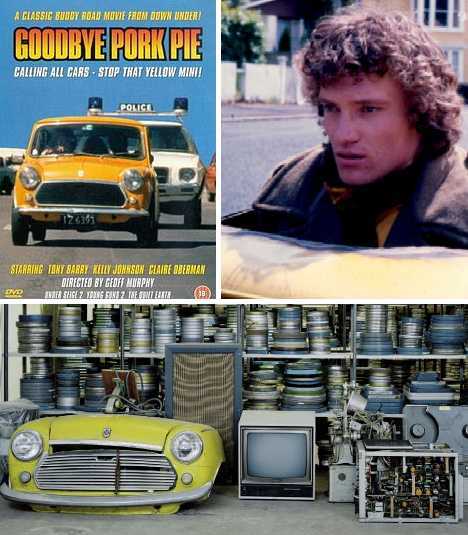 The vehicular star of the film is a bright yellow 1979 Mini 1000 MkIV, which does a surprisingly good job of outrunning more than a few V8-engined NZ police cars. 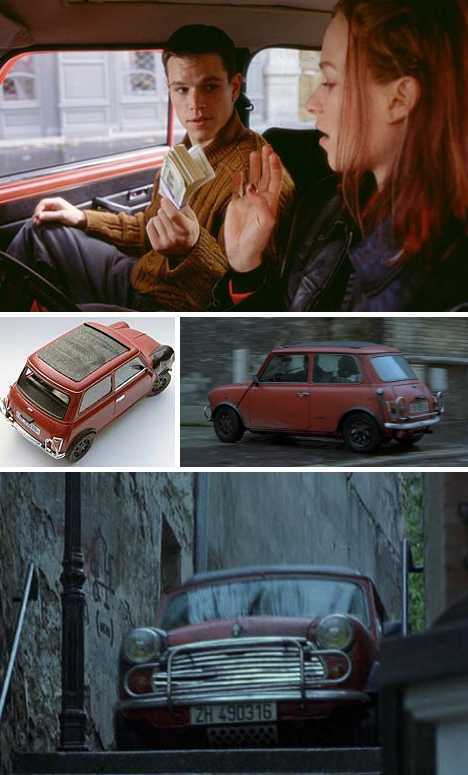 The Mini gradually loses parts throughout the film as the characters are forced to sell them for cash. Gas isn’t a problem as the Mini’s ability to reach speed from a standing stop comes in handy at more than a few gas & dashes. It may not have the raw power of Steve McQueen’s 1968 “Bullitt” Mustang but the 1989 Mini Mayfair MkV Jason Bourne pilots in 2002’s The Bourne Identity has the advantage when negotiating narrow alleys and urban staircases. 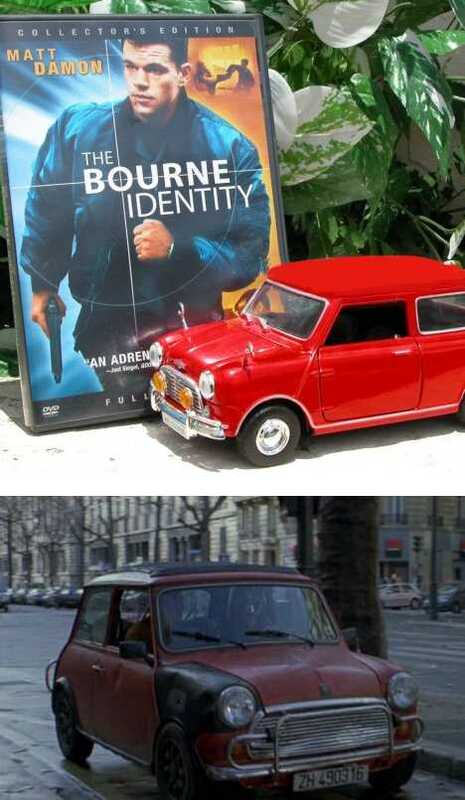 The Mini actually belongs to Bourne’s girlfriend and isn’t in the best shape to start with – things don’t get better as the action proceeds, either. It’s not often featured film cars are weatherbeaten “beaters” but the Mini seems to be made for such roles. Its legendary toughness and simplicity have been a trademark of the brand since its humble origins in the late 1950s. Saving gas is one thing, savings lives quite another but the Mini pulls off both feats with understated English aplomb! In the original Austin Powers film outing, our International Man of Mystery toured around quite ostentatiously in a Union Jack-bedecked Jaguar E-type. 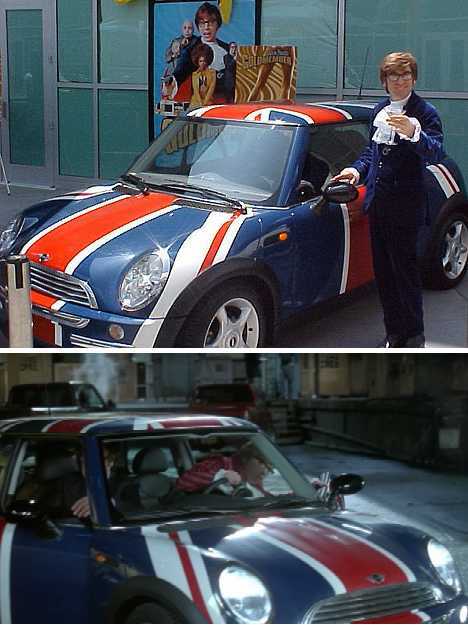 The second go-round, 2002’s Austin Powers in Goldmember, saw another British auto icon reclaim its due: a 2001 Mini Cooper similarly emblazoned to be as English as roast beef & Yorkshire pudding. Though the era of the “classic” Mini ended in the late 1990s, the new millennium saw a new Mini that was a little more Germanic under the skin. No matter – the new Mini still looks like no other car out there and it makes the perfect ride for Austin Powers’ father Nigel… played perhaps not coincidentally by quintessential British actor Michael Caine. 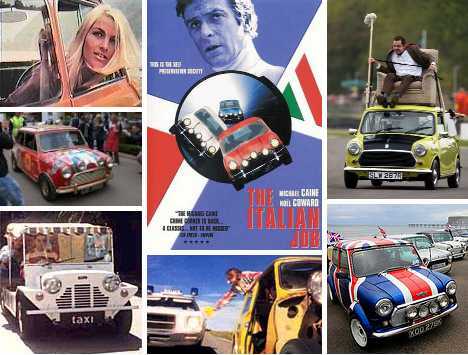 The 2003 reboot of The Italian Job gave a respectful nod to both the original 1969 film and the classic Mini Coopers featured in it. 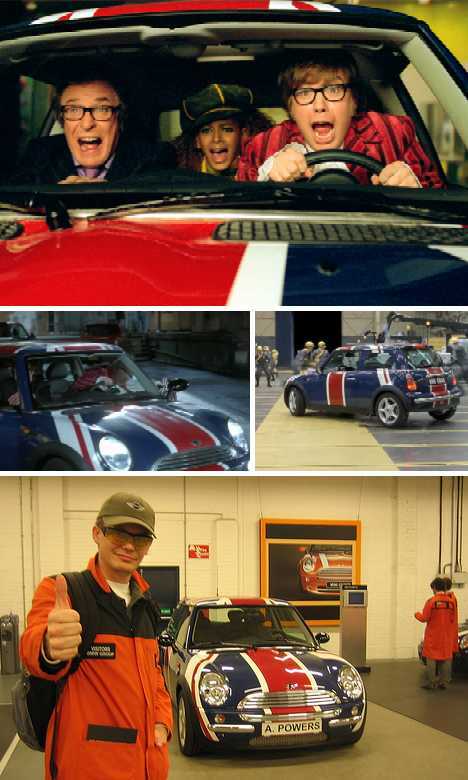 The latter is most noted in the film’s early scenes when the character played by Charlize Theron is shown driving a red 1997 Rover Mini Cooper MkVII. Seeing this car, it’s remarkable how much the Mini changed – outwardly, at least – since the advent of the MkII a full thirty years before. The updated version of The Italian Job may have taken some heat for its in-your-face product placement but really, what else could the producers do? The Mini is one of automobilia’s most identifiable brands and there would be no point in trying to disguise the trio of new Minis used in the film. 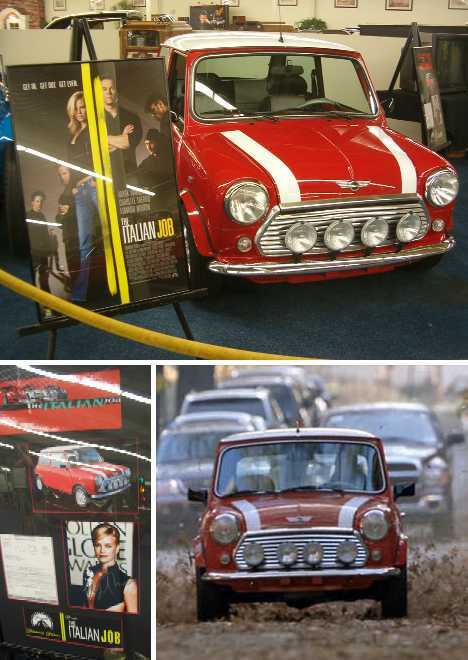 Did the prominence of Mini cars in the film impact upon sales in the real world? It did indeed… but then, that’s also a repeat of what happened in 1969. You’ve come a long way, Mini! 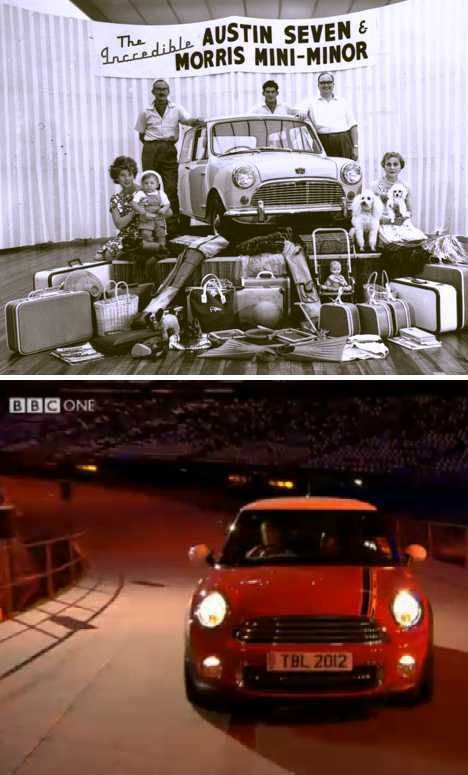 From its big & bold introduction in the summer of 1959 to its cool cameo appearance at the Opening Ceremonies of the 2012 Summer Olympic Games in London, the Mini has soldiered on, always looking pretty much as it always has. As any living celebrity knows, looks will only get you so far but so far, this car is still a star!